Notes: I found this book at the library. I decided to check it out because someone on the Goodreads' College Students group had mentioned it. A brief summary: Mr. Penderwick (the father) and his daughters Rosalind, Skye, Jane, and Batty take a vacation, thinking of a rundown cottage. They come to a small cottage on an estate property called Arundel, owned by Mrs. Tifton, with whom the four girls battle. The four Penderwick girls, along with Mrs. Tilton's son Jeffrey, a dog (Hound), two rabbits, and a gardener, have many exciting adventures in three weeks. My thoughts: If you liked Little Women but wished there was a more contemporary version, this book is definitely for you! I found all four girls delightful in their separate ways, and they had very complimentary personalities. Rosalind is the oldest and seems to view life with a more serious lens, especially since she remembers their deceased mother the best. That being said, Rosalind's life certainly gets more interesting at Arundel. Skye is the second-oldest; she's a bit more fiesty and tomboyish, though she adores math and minimalism. Then there's Jane, who is a romantic, and dreams of becoming a published author. She writes her own book series, featuring a character named Sabrina Starr, and persists in her writing. Finally, there is four-year-old Batty (short for Elizabeth) who is so delightful and charming you can't help but love her. I felt, as I was reading, that each girl needed her sisters. This book is full of adventure, love, and loads of youthful fun. Mrs. Tifton, the property owner, makes the perfect childhood enemy. She is unfriendly, near obsessive about her gardens, and rigid. You will grow to both dread and anticipate the Penderwicks' interactions with her! Mr. Penderwick is an interesting character. A plant-lover, he spends quite a bit of time speaking in Latin or wandering off into the fields to research plants. He's certainly not a neglectful father, but his parenting approach (and strange interests) reminded me of Haviland de Luce, Flavia de Luce's father, in the mystery series. Because of this, as well as the character names, it was difficult to remember that this is a contemporary book. It certainly doesn't have the same feel as Little Women, but I could easily see this being prim-and-proper England during the mid-20th century. Perhaps modernity has tainted my perception of children; it's hard to imagine inventive games, physical activity, and technology-less families anymore. This book certainly recaptured that experience for me, though. However, the scenario seemed at times slightly improbable for modern-day Massachusetts. Despite the dichotomy between the setting and the plot, I adored the characters in this book, and I'm planning to check out the next installment of the Penderwick adventures when I'm at the library. 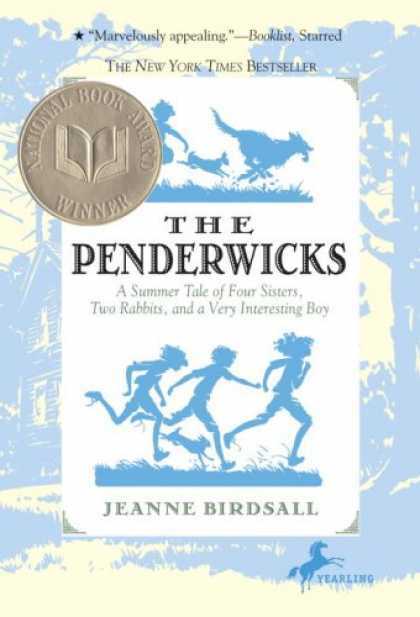 The Penderwicks is a lovely, heartfelt novel that children and adults alike will love. This looks really cute! Might have to check this out..especially since I adored Little Women and similar novels! Dayna-- I'm with you on that one! My sister and I were just talking about this the other day..we were SO imaginative when we were younger. We played so many make believe games and had fun playing things like "School" and "House." We had dolls and stuff but our favorite thing to do was run around outside! So sad how most kids are glued to the tv or computer! This sounds wonderful. I loved Little Women. I think given the opportunity, children are still creative, but too many parents just plonk them in front of the TV/computer.